GY-LS300CHE Super 35 camcorder plus Olympus highest quality MFT PRO Lens. Small and light compact full featured 4K camcorder JVC GY-HM250 comes also with streaming processor and internet connectivity for content delivery to anywhere! Ready to use bundle with basic accessories (bag, tripod and recording media)! 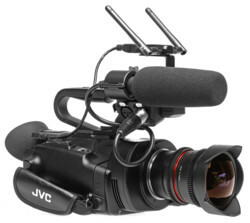 Small and light compact full featured 4K camcorder JVC GY-HM250 comes also with streaming processor and internet connectivity for content delivery to anywhere! 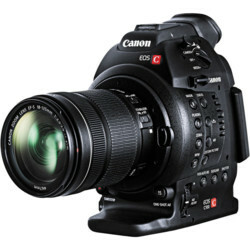 Small interchangeable lens full featured 4K Super 35mm camcorder JVC GY-LS300 - perfect cinematic expirience. Comes also with streaming processor and internet connectivity for content delivery to anywhere! The GY-LS300 with Ninja Inferno is a perfect combination. With the 4.0 firmware ugrade on the GY-LS300, you'll be able to record Ultra HD (3840 x 2160) at 60p on the Ninja Inferno. Plus, when the camera is set to J-Log1 gamma recording mode, the Ninja Inferno will record the HDR footage and display it on its integrated 7-inch monitor. The JVC camcorder trigger even starts and stops the Inferno's internal recorder. This bundle is for serious cinema production! 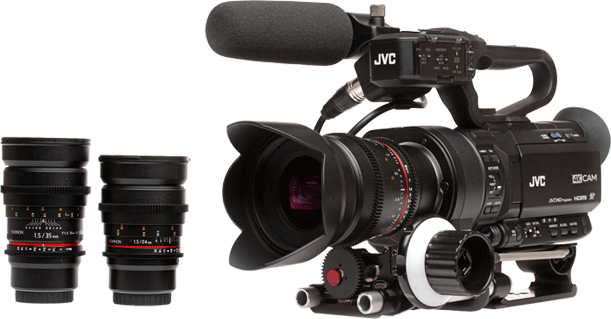 Small interchangeable lens full featured 4K Super 35mm camcorder JVC GY-LS300 is for perfect cinematic expirience. Comes also with streaming processor and internet connectivity for content delivery to anywhere! Ready to use bundle with basic accessories (bag, strong tripod and recording media, additional batteries)! Included is Panasonic Lumix G-Vario lens package (7-14mm, 12-35mm, 35-100mm zoom lens), portable 3 pcs extended LED light kit, Atomos Ninja Inferno monitor with 480 GB SSD disk. Included is also Vocas underneath grip with Follow Focus and Matte Box! 1x Panasonic Lumix G Vario 7-14mm f/4.0 ASPH. HD ENG camcorder with live streaming capabilities. The GY-HM660's long (23x) wide angle lens is perfect for fast paced ENG. The camera offers superb low light performance with F12 sensitivity at @2000 lux. It's also the world's first camcorder with a built-in IFB audio channel. Compact handheld news HD camcorder JVC GY-HM660 with extremely usable 23x zoom lens, dual codec recording, streaming and direct file transfer (FTP, WiFi) for content delivery to anywhere. The GY-HM660 is compatible with Advanced Streaming Services, powered by ZiXi, for reliable live content delivery. Camera can be controlled on the field via Wi-Fi and Internet from a smartphone (iPhone, Android), tablet (iPad, Android), PC or Mac. Ready to use bundle with basic accessories (bag, tripod and recording media, additional batteries, ethernet and WLan adapter)! Compact handheld news HD camcorder JVC GY-HM660 with extremely usable 23x zoom lens, dual codec recording, streaming and direct file transfer (FTP, WiFi) for content delivery to anywhere.The GY-HM660 is compatible with Advanced Streaming Services, powered by ZiXi, for reliable live content delivery. Camera can be controlled on the field via Wi-Fi and Internet from a smartphone (iPhone, Android), tablet (iPad, Android), PC or Mac! Ready to use bundle with basic accessories (bag, tripod and recording media, additional batteries, ethernet and WLan adapter and high quality UHF wireless microphone package)! Also with very practical interview small light kit, for quick achievement of proper luminance in various conditions! The GY-HM850 is perfect weighted shoulder-mount form factor camera. The GY-HM850 provides outstanding full HD image capture and delivery, while the built-in streaming engine, FTP and GSM connectivity allows live HD transmission directly from the camera without requiring additional encoding hardware.The GY-HM850 is compatible with Advanced Streaming Services, powered by ZiXi, for reliable live content delivery. Camera can be controlled on the field via Wi-Fi and Internet from a smartphone (iPhone, Android), tablet (iPad, Android), PC or Mac. Basic bundle includes accessories for instant work on the field: bag, batteries, recording media and durable E-Image tripod! Network bundle includes Ethernet adapter and WLan adapter for immediately work on the field, bag, batteries, recording media and durable Miller tripod. The GY-HM850 is perfectly weighted shoulder-mount form factor camera. The GY-HM850 provides outstanding full HD image capture and delivery while the built-in streaming engine FTP and GSM connectivity allows live HD transmission directly from the camera without requiring additional encoding hardware. The GY-HM850 is compatible with Advanced Streaming Services, powered by ZiXi, for reliable live content delivery. ENG bundle includes perfect compatible equipment for immediately work on the field: nice, practical light package (3x Rotolight NEO Light), professional AZDEN wireless microphone solution, bag, batteries, recording media and durable Miller tripod.